TALLAHASSEE – Gov. 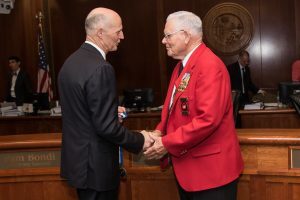 Rick Scott awarded retired Maj. John L. Haynes with the Governor’s Medal of Merit during the March 14 Florida Cabinet meeting. Haynes, who retired in 1975, is a combat veteran who served in the U.S. Marine Corps during World War II, the Korean War and Vietnam War. In 2013, Haynes was inducted into the inaugural class of the Florida Veterans’ Hall of Fame for his decades of veterans’ advocacy. Haynes, a Florida native who began his career as an enlisted member, is chairman emeritus of the Florida Veterans Foundation.